Unlike every other Quilt Market I’ve attended, I am combining Portland Spring Market with an actual real sight-seeing vacation. So far, Portland has been great! I have city pics to share with you. I, of course, have schoolhouse and market pictures to share too- but today is tourist day on the sewing blog. 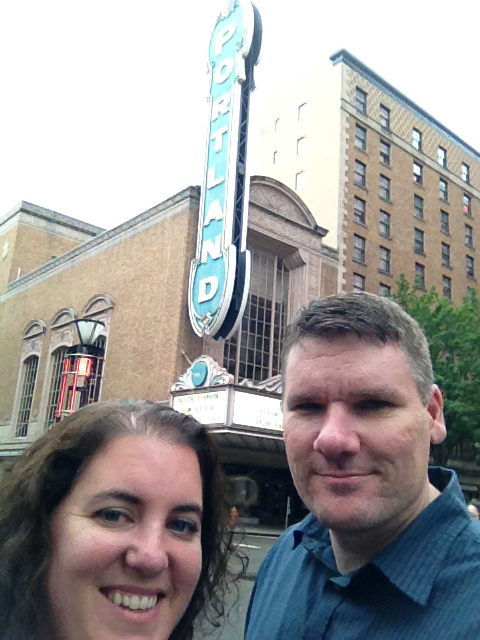 My husband and I were able to see the city after the schoolhouse series let out on Friday. Portland has a great light rail and public transport system which makes seeing all sorts of things very accessible in the city. First up- mid-day trip out for LUNCH. We were able pop into a couple of the many many many food truck parks in Portland. 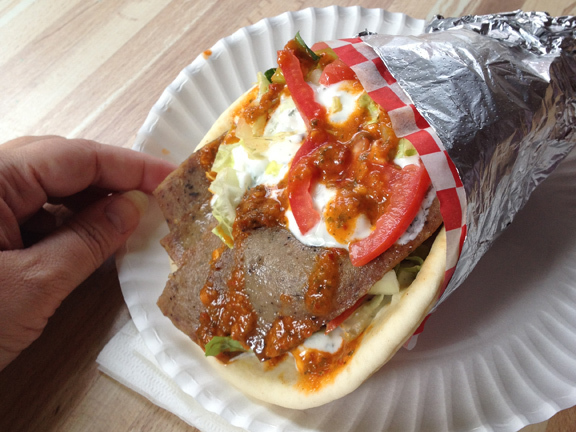 I decided to partake of a Gyro- but here’s the thing I didn’t anticipate- this thing was the size of my head. Seriously. The biggest Gyro I’ve ever seen. The chef handed me my plate with about 10 napkins… which I thought was a bit much…. until I was using napkin #9, thinking – this guy knows his stuff! Delicious! 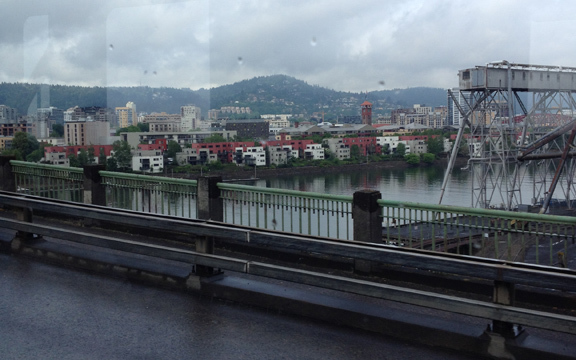 Complete to all Portland stereotypes I’ve ever read- It Rains Here. Often. This is the view of the gorgeous hillside and banks along the river, as seen from the train. I was surprised how many private boats are along the river, too. Wonderful to take in- well, the boats, not the rain. Thankfully, I did pack an umbrella. Humid + rainy + curly = More Hair than I’ve ever seen on my own head. I’m talking HUGE unnatural-fro up there. Thank you Portland. Thank you so very much…. Trip to Portland wouldn’t be complete without visiting the craft brew area called the Pearl District. 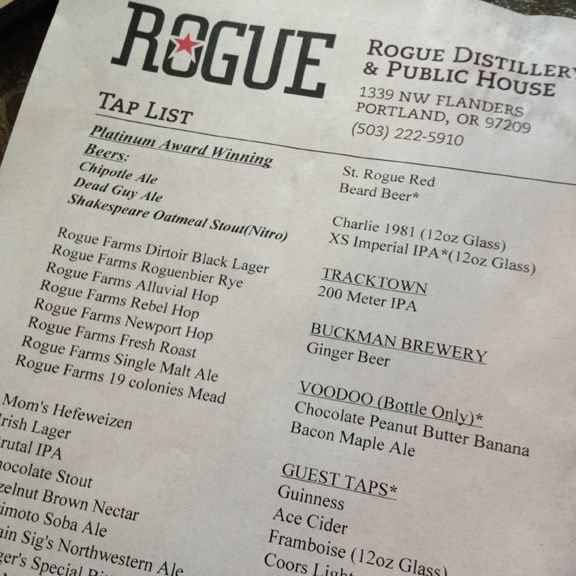 Rogue Public House was on our list and thankfully not too hard to get to, though not on the rail line. Mmmm….. Rogue Hazelnut Brown….. mmmmmmm……..
More pictures of Portland, more Quilt Market, more Quilts, more book signing info coming soon! Hi Jen. Glad you are enjoying Portland. It’s a great city. 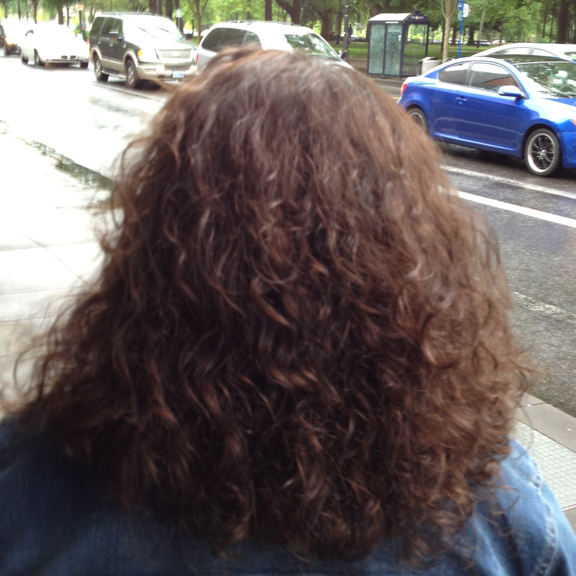 I get curly hair (talking Shirley Temple curls) when I am in the Pacific Northwest. I lived in WA state for 17 years. 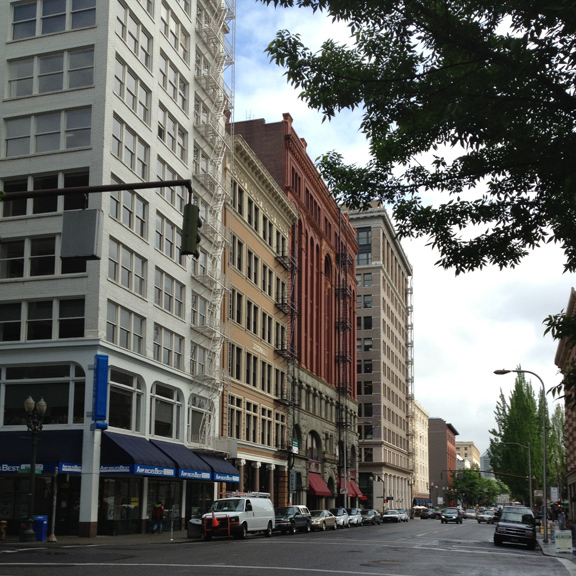 I lived in Portland when I was little (my younger sister was born there). I miss having some rain though. You remember NM and how dry it is here. Well we’ve had a drought for several years and not even any monsoons. So please send some rain our way. Be sure to check out Fabric Depot while you are there (if you still are there?). It’s like Home Depot, but for fabrics, sewing, quilting. plus no sales tax in OR. You better allow at least 4 hours if you go….seriously it’s that huge and that much to see. Jen… I was whizzing through my blog reader at work today and saw your hair, and even though I did not know it was your blog (whizzed by the title part too fast), I knew it was your hair! LOL. Just thought you’d find that funny. Miss you. sounds like your having fun! Enjoy!